Texas - home of big trucks, savoury barbeque and the next big thing: Terminal. Proudly declaring Dallas their home, Terminal's five youthful members, ranging in age from 18 to 21, bring anything but a youthful sound to the table. 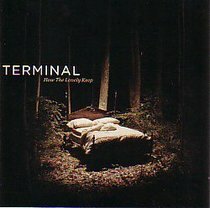 Already garnering comparisons to everyone from Taking Back Sunday to Further Seems Forever and Recover, Terminal's style ranges from cathartic and soaring to fragile and delicate, while still maintaining a passionate intensity throughout. About "How the Lonely Keep..."